Cream together butter, oil, sugar and brown sugar in medium bowl. 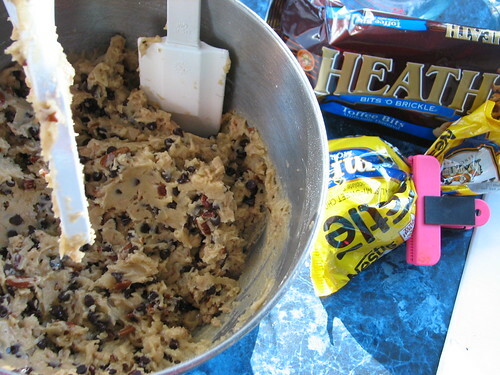 Mix in vanilla and butterscotch extracts. Add eggs. 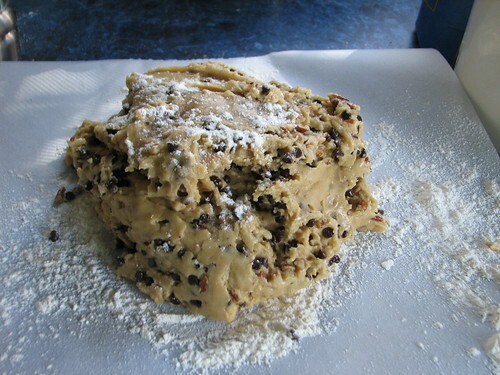 Combine dry ingredients and stir into creamed mixture. Add chopped toffee bar and pecans. Bake at 350* F for 25-30 minutes or until center is set. Cool for ten to fifteen minutes. Slice crosswise into 1/2-inch slices. Return slices, cut side down, to baking sheet. 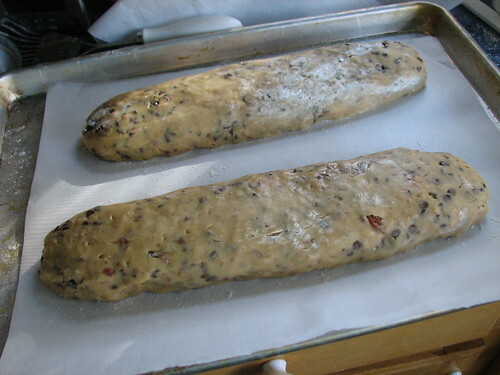 Bake 10-12 minutes on one side, then turn over and bake opposite side an additional five minutes. Cool on wire racks. I cut the slices in half before the additional baking. After they cooled, I packed them in zippered storage bags and placed them in a plastic container for freezing until needed. I dipped the end of each piece in chocolate when thawed. It made about 60 pieces. The recipe is from Gooseberry Patch 1999, p. 89. 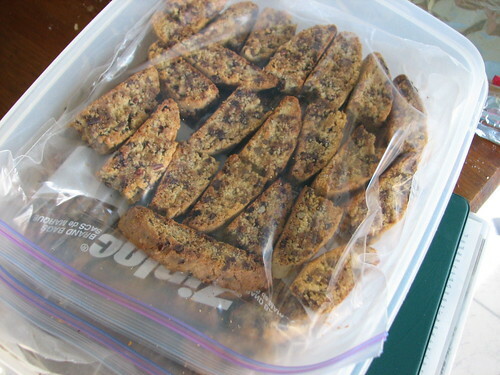 This entry was written by ~~Rhonda, posted on December 7, 2007 at 1:02 pm, filed under Christmas, cookies, Recipes and tagged Christmas, open house, recipe, toffee bar crunch biscotti. Bookmark the permalink. Follow any comments here with the RSS feed for this post. Post a comment or leave a trackback: Trackback URL. 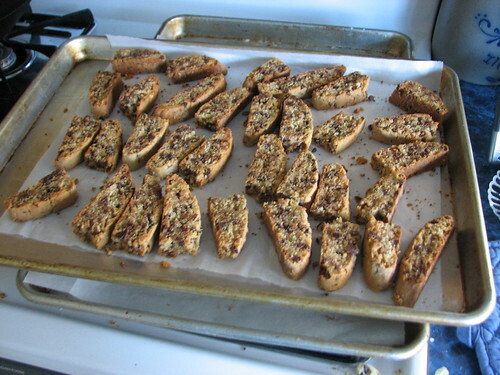 Rhonda — I made the toffee crunch biscotti for a cookie exchange with friends. The recipe got rave reviews! I wasn’t able to find the butterscotch extract, so I skipped it as well. 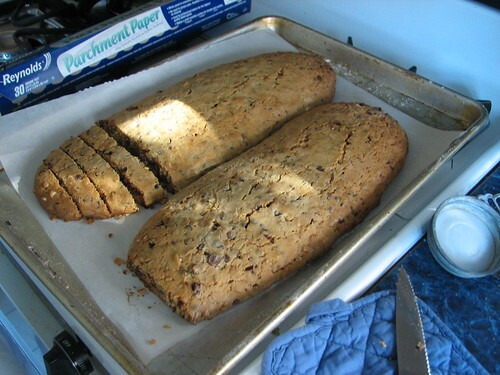 I am grinding my own flour now, so the whole grain (soft white wheat) gave the biscotti a chewier texture than I would have liked, but I’ll be experimenting with perhaps sifting out some of the bran. Oh My this looks soooooooooooo good!